This recipe is one of my friend’s favorite dishes that I make. It is also one of my more popular posts on my food blog, Kat’s Food Adventures. This is great on its own, or you can have it as a side to meatballs or chicken. Either way, I promise your family or friends will love it as much as mine do. See how it’s done, right here! Cook your pasta according to the directions on the box and drain. In a large pot, put in the tomato sauce, ricotta cheese and red pepper flakes. 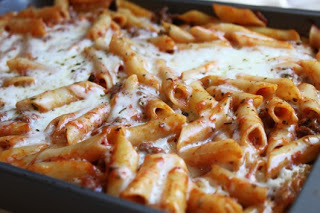 Toss the pasta and half of the mozzarella cheese with the tomato sauce mixture. Pour the pasta and tomato sauce mixture into the baking dish and top it with the parmesan cheese and the rest of the mozzarella cheese. Sprinkle parsley on top before serving. To add protein, serve with meatballs or chicken.